Rio Salado College | RioNews: Rio Congratulates Horizon H.S. Dual Grads! Rio Congratulates Horizon H.S. Dual Grads! 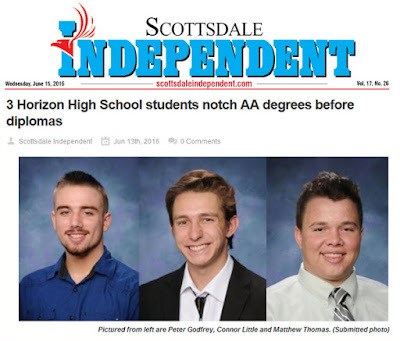 A shout out to Rio Salado 2016 dual enrollment grads from Horizon High School-- Connor Little, Matthew Thomas and Peter Godfrey-- who were recently featured in this Scottsdale Independent story. They were among a record-breaking 64 dual enrollment grads who earned associate degrees from Rio Salado College-- before graduating from high school. Learn more about Rio Salado's dual enrollment program: www.riosalado.edu/programs/dual.